While the register vents in the home serve an important purpose they should also look right for the space. There are several styles to choose from and in some cases, color choices are available. Whether the vent is on the ceiling, a wall, or the floor there are plenty of options. The ceiling diffuser usually comes in several different sizes. The round diffuser is available in white or brown. While most homeowners are likely to choose white the brown option may be suitable for ceilings with natural wood beams or exposed framework. A square diffuser also comes in powder coated white or brown. 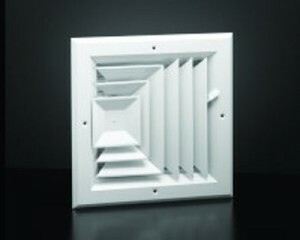 Several register vents are suitable for a side wall or a ceiling. They may include a damper to prevent air from concentrating in one spot. Some models come with vertical louvers while others come with horizontal louvers. Some come with louvers in multiple directions. The design choice may depend on where the heat or air is needed and the size of the room. The floor register with damper is most often used for floor vents. It can be adjusted for direction and the level of air flow. Many newer homes and town homes use this type of vent for cooling and heating systems. It is simple to install and can be easily removed for cleaning duct work if necessary. The floor model is available in brown and white options. When choosing register vents another consideration is size. Most wall,floor, or ceiling openings will be a standard size. The grill is measured from the inside so it can be matched to the opening. Some openings may be slightly larger. This is done to allow for proper leveling of the vent and is especially important for many wall installations. FAMCO is a company that manufacturers register vents for most home heating and cooling systems. The company also offers vents for chimneys, roof installations, soffits, and wall vents. There are plenty of options for each type of installation or each use. When choosing register vents it is important to consider style. However, size and usefulness of the vent for a particular purpose is also critical. Special products like motorized dampers may be needed for some areas like the soffit or a wall vent. FAMCO offers quality register vents and other products for home ventilation needs, including products for venting appliances like dryers. The experts can even make recommendations on products based on specific situations.